Q. Why can't I access full-text articles in PsycTESTS? PsycTESTS has an extensive and rapidly-growing collection of thousands of professionally indexed records. The article you are trying to access is probably just an indexed record which doesn't include full text. For general information about PsycTESTS, please visit this factsheet. 1. Limit the search to "Full Text". By checking the 'full text' limit, the search results will only show tests with full text in the PsycTESTS database. 2. 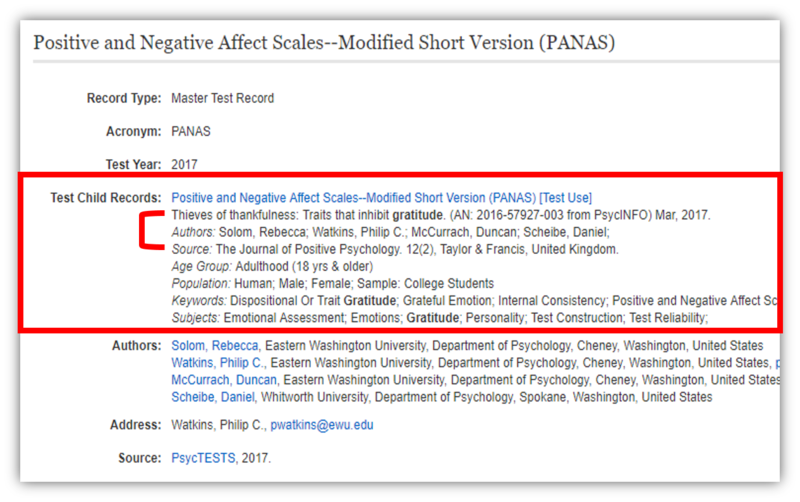 Note that many of the items in PsycTESTS do not have full text - but you can get the test in the journal article where the test was originally published. The Find it @ SMU Libraries button does not work to access tests. Instead, look up the original 'Source' from the 'Test Child Records' within the PsycTESTS record. Search the Libraries' main search box to determine availability through SMU Libraries. In the following example, look up 'Thieves of thankfulness' in the SMU Libraries. The Libraries have access to this article. This article describes the methodology used in detail, including the tests used.